John K. Addis reading from his book, The Eaton. 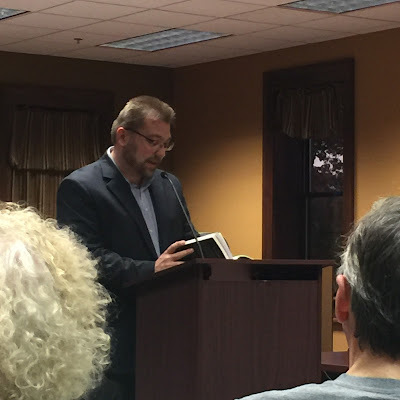 The Eaton Rapids Public Library hosted debut author John K. Addis tonight to discuss his book, The Eaton. He talked about his inspiration behind the book, what he learned while studying the history of Eaton Rapids, and he read a couple of passages from the book. Overall, a really nice guy. One thing he mentioned that I found interesting: his friends suggested to him to have a paperback copy available as well as the ebook version, and not surprisingly, the physical copies have been outselling the ebooks. And they say print books are dead! The Eaton is the debut novel of John K. Addis. 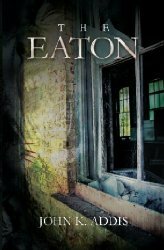 Spanning over 100 years of mid-Michigan history, but written in the gruesome style of ‘80s horror classics, The Eaton tells the story of Sam Spicer, who purchases the dilapidated Michigan Central Railroad Depot in Eaton Rapids with the dream of opening a hot new martini bar. But when he and his friends discover an abandoned underground hotel directly beneath the property, they must discover what happened to the original guests—before their own time runs out.